With 16.1" x 4.7" x 17.7" in overall dimensions, it covers a much larger area than your average back pillow. Equipped with side supports, the pillow helps battle scoliosis. 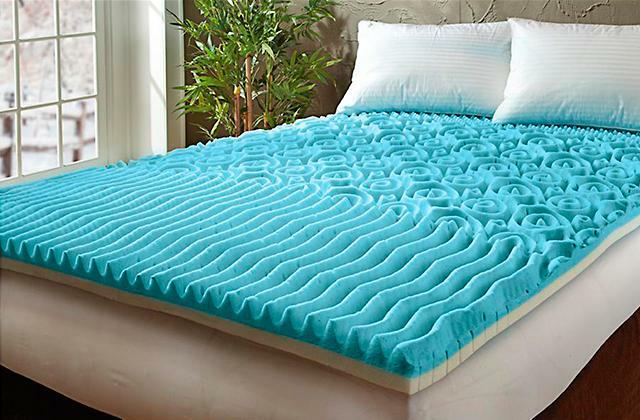 The foam padding is really durable and doesn't lose its volume over time. 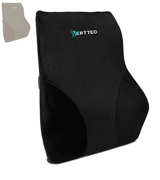 Vertteo VPP-BB is one of the best back support pillows around. With it, you won't have to pick and choose different parts of your back. It gives the whole area the necessary support. Snug and comfortable, it will help you relieve a myriad of common back problems. This back support pillow comes with a storage bag. 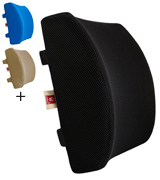 Its contoured curve structure, incorporating a lateral convex shape, adapts to your lumbar area. The cotton cover does not hinder air circulation. The integrated mesh reduces sweating. Relax Support RS1 is a small back support pillow that packs a serious punch. Its orthopedic composition gives you much more complete support. It is really easy to maintain. Plus, the model can be used both as a lumbar pillow and a neck pillow. 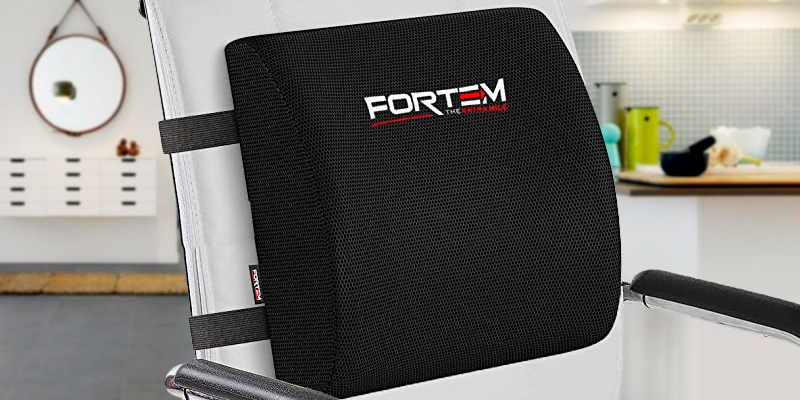 Supplied with 2 straps with buckles, as well as extension straps, you can use the device with an office chair, car seat, recliner chair, couch, or anything in-between. It'll be easy to make sure it doesn't slide and fits any surface perfectly. 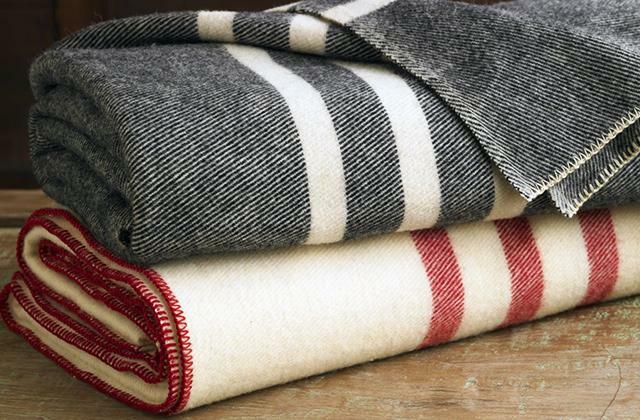 With its antibacterial properties, the cover never accumulates much of a smell. The zipper is a little jammy. It doesn't really matter whether you have any back issues or not. It doesn't even matter what kind of back issues are plaguing you. Flexible, firm, and affordable, you cannot go wrong with this back support pillow. One way or the other, your back will thank you for it. Strategically and ergonomically contoured, the pillow provides targeted support for the lower area of your back. A shape like that improves posture and reduces muscle strain. Made of resilient polyurethane, the foam delivers the perfect balance of comfortable cushioning and pain-relieving support. The label with the logo is positioned in an inconvenient spot. Xtra-Comfort H&PC-05466 is not bad at all. As far as we're concerned, the company's name holds true. 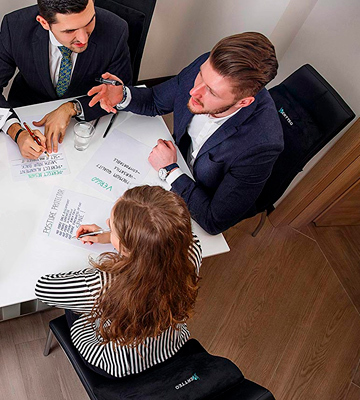 We could recommend it to lots of people but the model is especially suitable for those who spend extended periods of time in a sitting position and people recovering from injury. You can use the model in summer and it won't make you hot as the breathable mesh cover excels at wicking away moisture. 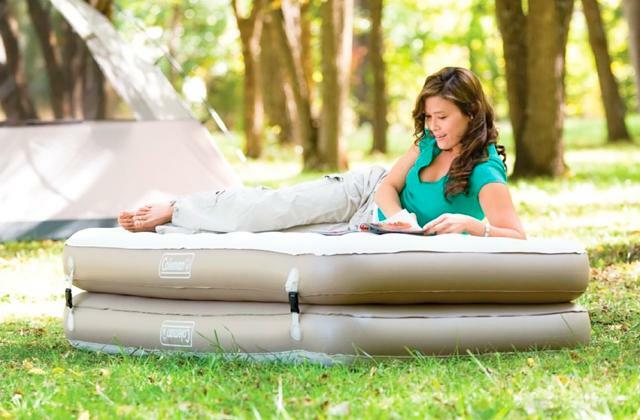 Build to evenly distribute back weight, the pillow is able to provide extra support. It is really lightweight and portable. The elastic straps are too loose. 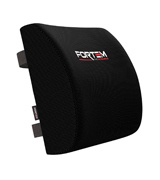 FRTM-17-15-LS back support pillow is comfortable and versatile. You can use it to turn a regular cheap chair into an expensive gaming chair. It doubles as a footrest for tired or swollen legs. The pillow prevents and helps against a bunch of lower back issues. Vertteo VPP-BB doesn't just tend to your lumbar area. It treats the entire back the way it needs and, frankly, deserves. With 16.1" (width) x 4.7" (depth) x 17.7" (height) in overall dimensions, it covers a much bigger area than your average back support pillow. Though it isn't just about its size. 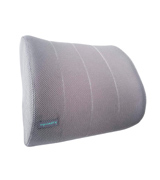 Equipped with side supports, the pillow helps battle scoliosis, a particularly prevalent issue with office workers. 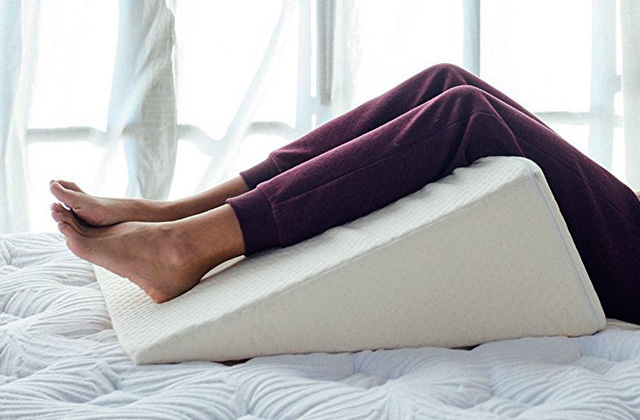 Incorporating 100% pure molded memory foam, it gives you a comfortable but firm fit, conforming to the shape of your back. The foam padding is also surprisingly durable and, dissimilar to the usual deal, doesn't really lose its volume over time. The adjustable elastic strap isn't something we haven't seen before. But, being extra long (able to extend from 16.9" to 42.9") with a secure clasp, it does a solid job keeping the back support pillow in place no matter how much you tend to move around. The faux fur cover is hypoallergenic, machine washable, and zipper removable cover. Made of black velvet, it is super soft and snug. Plus, it makes a friendly furniture accessory for any house decor. Now, we are not saying that the model is flawless. But, as far as we're concerned, the only downside here is that the aforementioned material isn't breathable, so it does make your back sweat a little bit come summer. 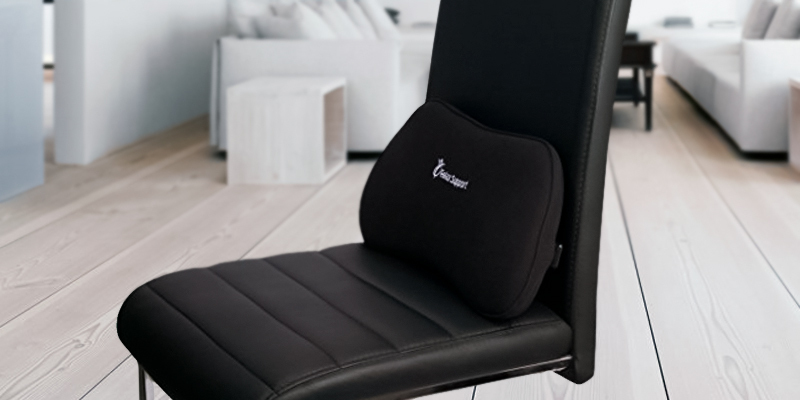 Now, without wasting any more of your time, Vertteo VPP-BB is one of the best back pillows around. With it, you won't have to pick and choose different areas of your back. It treats the whole thing fair and square. Snug and comfortable, it will help you relieve a myriad of common back problems. Relax Support RS1 is a little small. But it has plenty going for it. Sure, that "plenty" doesn't include side supports, which is a bit of a shame. But that's also the reason the pillow is so portable. You can throw it in your backpack and bring it with you to work. By the way, the pillow comes with a storage bag, a nice touch as it doesn't just help with transportation but also protects the pillows appearance. The people behind this back support pillow proud themselves on its is orthopedic design and, for the most part, we can see why. The model's contoured curve structure, incorporating a lateral convex shape, gives you extra support and adapts to your lumbar area. 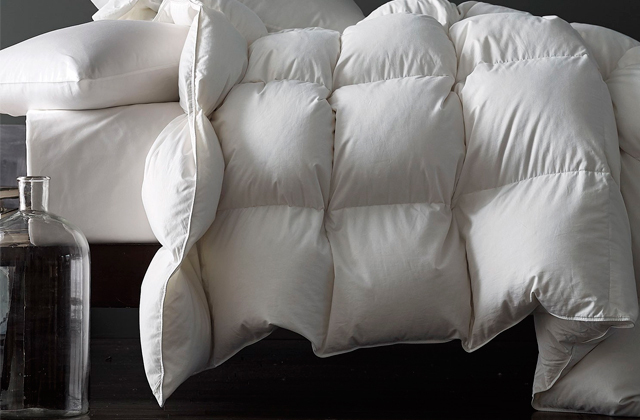 The breathable and removable cotton cover does not hinder air circulation, so you feel comfortable all day long. Plus, the integrated mesh reduces sweating, keeping that back of yours cool and dry. The cover is easily removable and machine washable, so the product is hardly demanding when it comes to maintenance. On top of everything else, cotton is cotton, meaning that the material is as hypoallergenic as usual and particularly resistant against bacteria buildup. It's not much but it does make the whole thing a little more hygienic, which isn't a bad thing in our book. 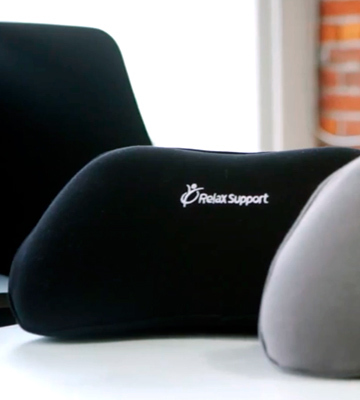 In short, Relax Support RS1 is a small back support pillow that packs a serious punch. Its orthopedic composition gives you much more complete support. Plus, the model can be used both as a lumbar pillow and a neck pillow. 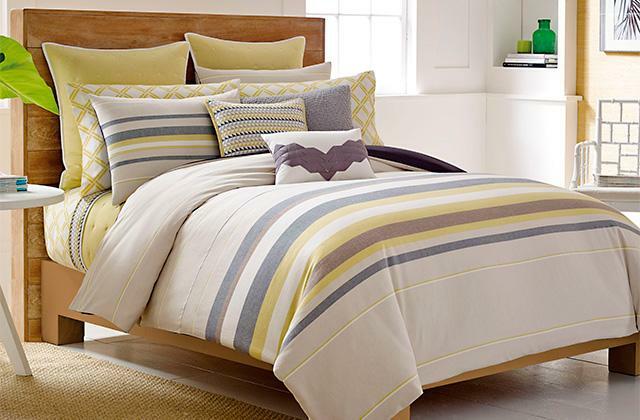 One of the best things about LoveHome LH-ML001 is just how versatile it is. Including 2 straps with buckles, as well as extension straps, you can use it with an office chair, car seat, recliner chair, couch, or anything in-between. With all of these straps, you'll be able to make sure it doesn't slide and fits any surface perfectly. Of course, being able to put this thing anywhere you want wouldn't be much of an appeal if the pillow itself was subpar. But subpar is hardly the word we would use to describe it. If we had to, we would rather go with anything along the lines of sturdy, supportive, or effective. Featuring ergonomic streamlining and molded with high-quality memory foam, the pillow gives you excellent lumbar support. 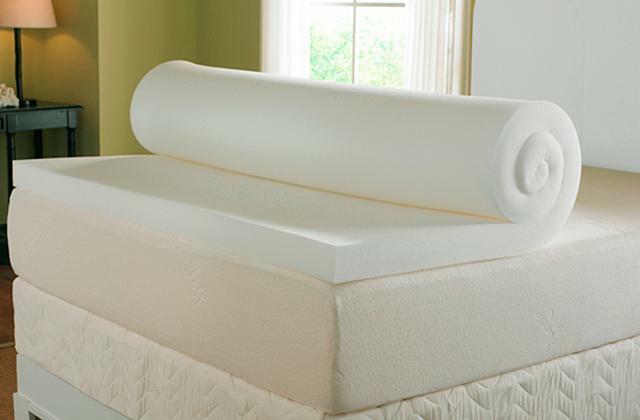 It never flattens out and, just like any other proper memory foam, compresses to take the curve of your back. This way, it relieves numbness and makes you feel really comfortable. 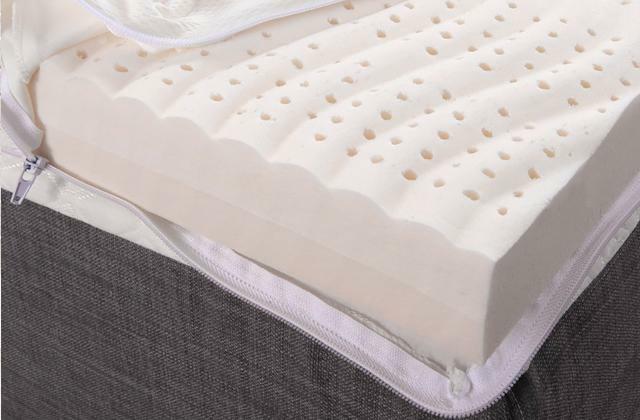 Nothing out of the ordinary but another little detail that makes this back support pillow such an attractive purchase is the mesh polyester cover. It doesn't absorb sweat. Durable, removable, and machine washable, it is easy to maintain. 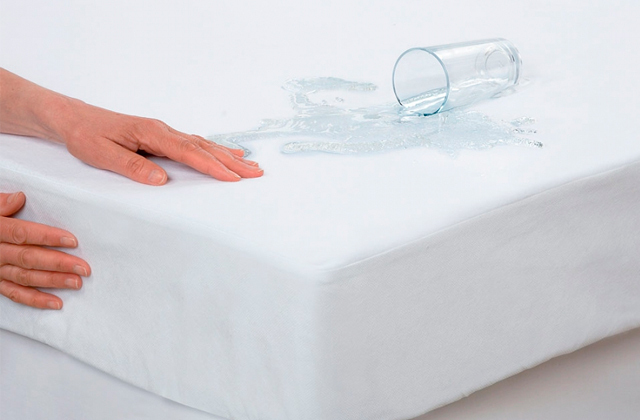 With its antibacterial properties, the cover never accumulates much of a smell. To sum it all up, it doesn't really matter whether you have any back issues or not. It doesn't even matter what kind of back issues are plaguing you. 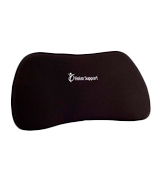 Flexible, firm, and affordable, you cannot go wrong with this lumbar support pillow. The lower part of your back, also known as the lumbar region, is easily its most vulnerable part. It suffers from the modern lifestyle more than just about any other area of your body. It needs help and, with Xtra-Comfort H&PC-05466, you should be able to give it that help. Strategically and ergonomically contoured, it provides targeted support for the aforementioned area of your back. A shape like that improves posture and reduces muscle strain. It should also be able to alleviate back pain caused by sciatica, stenosis, herniated disks, arthritis, pregnancy, and all sorts of injuries. For the most part, it doesn't differ that much from every other back support pillow on this list. But we would like to give a little extra attention to the memory foam. 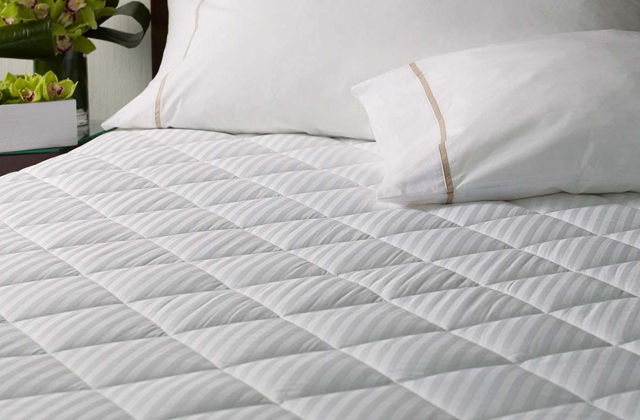 Made of the most resilient polyurethane, the foam retains its shape for years. It delivers the perfect balance of comfortable cushioning and pain-relieving support and that's all that we ask for. In case we haven't made it clear yet, the pillow is really comfy, not just because of the memory foam but also thanks to the soft polyester cover. That being said, we can't get behind the label with the company's logo. Positioned in an inconvenient spot to the right bottom corner of the pillow, it can be a little itchy. However, other than that, we don't really have any major complaints about Xtra-Comfort H&PC-05466. As far as we're concerned, the company's name holds true. 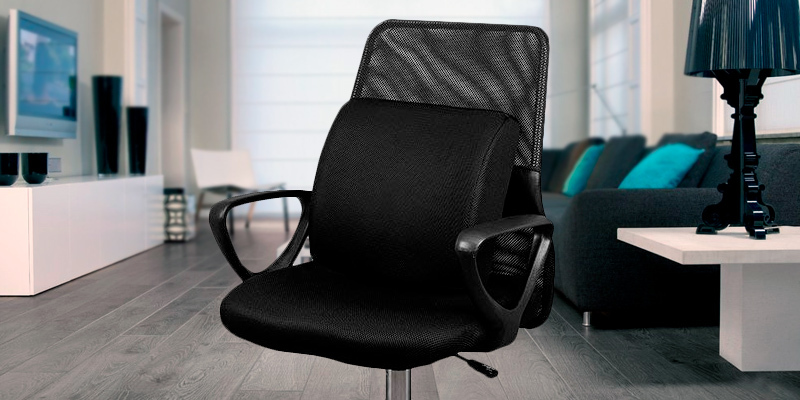 We could recommend it to lots of people but the model is especially suitable for those who spend extended periods of time in a sitting position and people recovering from injury. 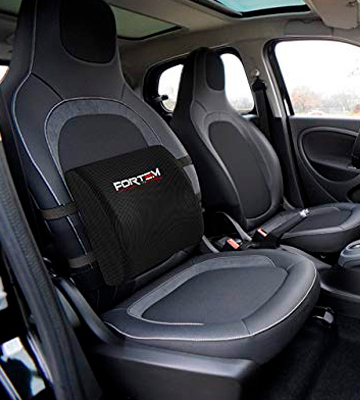 Fortem, with their "the extra mile" slogan, would have you believe that the company always goes the extra mile with their products. Well, we'll leave it to you to be the judge of that. But, as far as we can tell, that slogan is mostly accurate. There isn't a whole lot of difference between this pillow and other models in this review and that's not a bad thing. As per usual, it all starts with the cover. The fact that it is easily removable and washable is always a plus as these details make it really easy to clean it. You can use it in summer and it won't make you hot as the breathable mesh cover excels at wicking away moisture. Built to evenly distribute back weight, the model is able to provide extra support. As for the inside, this back support pillow packs more or less the usual memory foam. Compressed by the heat of your body, it contours your spine as well as the next foam padding. Including a couple of straps with buckles, you can fasten it to just about any seat. Though they are a little loose, so you might have some difficulties with smaller chairs. On the flip side, the model is really lightweight and portable, so you can even bring it with you on a plane. All in all, FRTM-17-15-LS back support pillow is comfortable and versatile. You can use it to turn a cheap computer chair into an expensive gaming chair. It doubles as a footrest for tired or swollen legs. The pillow prevents and helps against a bunch of lower back issues. Your heart may be the driving force and your brain, umm, well, the brain of the operation, but the back is the centerpiece of your body. They don't call the main support structure of any system or organization a backbone for nothing, do they? Unfortunately, since the highest workload is often relegated to this centerpiece, people tend to suffer from all sorts of back issues. That's especially true for the modern day and age where we spend most of our time in a sitting position, often crouched and with a bad posture. Your back deserves better. You guys need to sit down, reconcile your differences, make it up, and restore your relationship. One of these back support pillows will be a good place to start. As you'd imagine, what we're dealing with here is a really simple device. You put a pillow like that on an office desk chair, a car chair, or your favorite sofa at home and it provides you with the necessary lumbar support. It will help you get rid of back support, soothe lumbar pain, as well as achieve perfect alignment with the lower and upper thoracic area of the spine. Of course, as important as it is, your back is not the only important part of your body. Generally speaking, they all are. We all have our weak areas, so make sure to look through our reviews of knee braces, ankle braces, or shoulder braces.